My pregnancy mood swings can pretty much be measured by the number of tissues I use crying over ridiculous things! 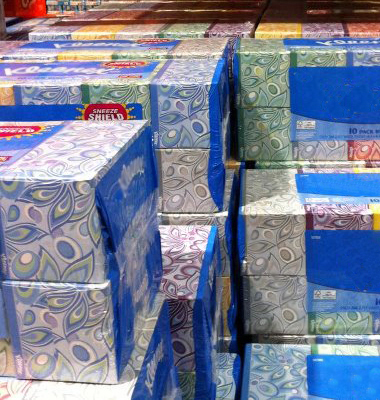 We are talking buy-in-bulk-at-the-warehouse-store amounts of tissue. I have always been a crier. Weepy commercials: check. A good book: check. Sad movies: check, check! So, add the fluctuating hormones that accompany growing a human and it can get a little out of control. My husband is used to it (he has been down this road a few times before), and my older kids aren't really fazed by it. My poor four-year-old hasn't quite figured out why I am crying over her cartoons, though. For some women, the pregnancy weepies actually leave them during the second trimester. Mine stay with me all 9 months and then even a few more months after the baby is born. But they don't bother me at all, especially this go-round. I know it is normal and I know it is a result of the hormones in my body that cause this miracle to be possible. That is even more evident this time, because for the first trimester my body decided that it didn't want to make some of those hormones. That resulted in a lot more tears for me because we almost lost this little guy. I will take the weepy pregnancy any day of the week. I am about 5 seconds away from my third trimester and well on my way to feeling the only other pregnancy emotion I am familiar with: cranky! Of course, I think that has a lot to do with my inability to sleep comfortably the last 12 weeks. I have never had to deal with anxiety or depression issues that can also accompany the change in hormones during and after pregnancy; if you are feeling either of those, make sure to talk to your doctor. Sometimes we feel like we just have to deal with certain emotions because it is all part of the package, like my pregnancy crying, but it is always a good idea to have your doctor make sure there isn't something else going on. I would love to hear your experience with pregnancy emotions. Any tips for keeping yourself from crying uncontrollably at a tissue commercial? Any advice for someone who might be dealing with other pregnancy emotions?